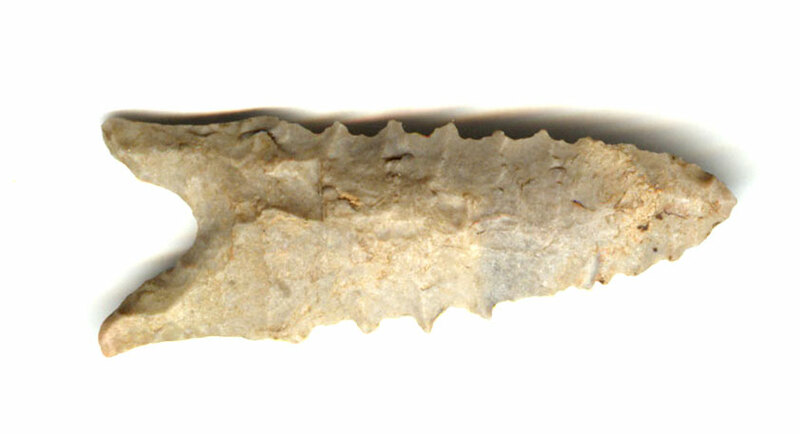 A Normal Size, Nicely Serrated, Visibly Aged And Anciently Used, Well Made Dalton Point That Exhibits Surface Oxidation Aging And Stone Coloration Patination, Consistent Aged Surface Deposits, Correct Style Base And Overall Shape, Correct Rolled Basal Stem Edge Hafting Dulling, Aging In The Blade Serrations, Correct Basal Thinning, Correct Early Style Blade Flaking, Correct Material And Manufacture For The Area Found, Ex-Kevin Farmer And Dr. Kent Westbrook Collections. Many Early Points, Such As This Nice Example Were Found In The Area When Land Was Being Leveled For Rice Production. Includes A Ken Partain Certificate Of Authenticity.